Visibility can be hard, but it's worth it. Mingle is a 9 years JRuby Rails project. We do test-driven development and continuous integration. We write selenium tests to test everything since Oct 2006. For a long time, our build time was 1 to 2 hours. We thought it was a good balance of build time and resources needed. 2014, we had about 12+K tests, including units, functionals and selenium tests. The best build time was 1 hour ran in parallel on 46 VMs. We ran test in parallel by Go CD jobs and TLB. There were 46 test jobs in one Go CD stage. Units, functionals and selenium tests were different. So We created 3 TLB tasks to distribute them separately. We configured TLB to distribute tests by test runtime for having similar build time. Where was time spending when test was running? Were there bottlenecks in test code? Profiling one test won't help. To figure out what's bottleneck for entire build, we need profile all tests running. Profiling generates lots of data. 1 hour build on 46 VMs will generate tons of data. We need merge/aggregate data collected from build VMs for analysis. First I ran Sampling Profiler with test on build. Then sent all profiling call-graph data to the data analysis web application. Data analysis web application merges same build profiling result. Last, I built UI to navigate through profiling result. The sleep 1 code above caused build slept about 40+ minutes in total. Changing sleep 1 to sleep 0.1 fixed problem. Although there was no big bottleneck found, I was able to list and fix a handful small bottlenecks. Our build time reduced to 45 minutes, and became more stable. You're on the right track when you're improving visibility of the problem details. It can be hard. But hard work pays off. Detail can lead you to the truth. It is possible that 1 vertual CPU is not enough. So we increased build VMs to 2 vCPU. Build time decreased to 50 minutes. The result was not as good as we thought. So I compared all jobs runtime. It turned out some selenium test jobs ran twice faster than other selenium test jobs. As TLB balanced our selenium tests by time, we expect job runtime similar. My first hypothesis was TLB may not work as expected. Because tests didn't seem to be distributed well by runtime. To verify my hypothesis, I checked out TLB source code. It was more complex than I thought. And there is also no way to output more logs to verify it's correctness. But Go CD has good support for APIs, so I wrote Ruby script to verify my hypothesis. The following chart shows how the test runtime looks like on build. X-axis is job names; y-axis is job runtime. From this result, we can see the balance is not perfect, but OK. Because red bars are similar high across all acceptance (selenium test) jobs. Blue bars matched what I observed on build time. Then I ran same script on more builds. The outputs were similar, just different jobs got longer time to run. It's clear there are some VMs are consistent slower than others. Then Barrow Kwan found out 2 of our VMs hosts were overloaded when we increased vCPUs on our VMs. We have set the host NOT to overload the CPU core but there was a typo in configuration. After sorted out VM host CPU overload issue, our build time reduced to 30 minutes. So, don't just assume, prove it with detailed data. Make details visible. It leads you to the truth. 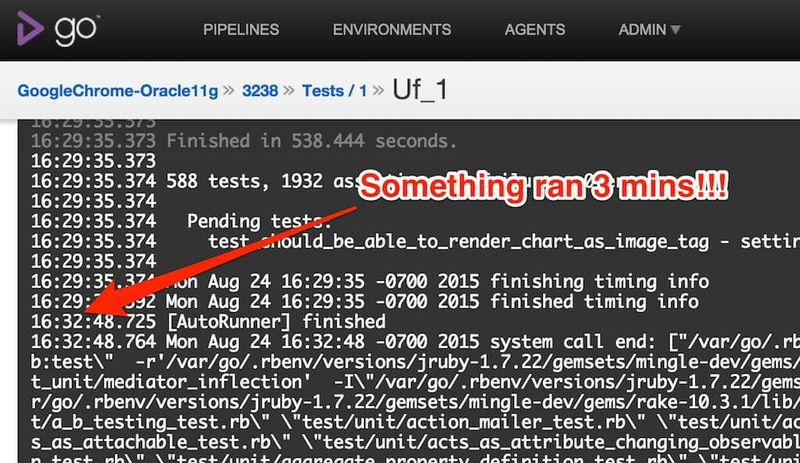 It only sleeps 2 seconds for one call, but it is called lots of times at the end of tests ran. After removed code sleep 2, there is almost no time spent at the end of test anymore. No one will notice it ever. The benefit of fixing this problem is outstanding for our pre-commit build. Pre-commit build is a build running a test suite before developer pushes changes to trunk repository. Our pre-commit build runs all unit and functional tests. The build time reduced from 18 minutes to 10 minutes with 20 processes on 3 machines. So, use/build tools that keep information visible, you may be surprised what you can get from it. Each time we improved our CI build performance, we thought that's the best we could do. But it was not true overtime. Look from different point of view. Make hypothesis and verify it. Find out more details of the problem. Learn from resolving similar problems. Visibility of the problem detail supports you hunting helpful data. Thus it gives you more opportunities to understand and solve problem.